Triplets is a "match 3" style game where you need to match 3 (or more) identical tiles in a row or column. Once matched, the tiles disappear and new ones appear. The object of the game is to progress through all the levels and end up with as high a score as possible. Each level will have progessively more difficult criteria to fulfil - these will be displayed at the beginning of each level. There are currently 25 pre-defined levels. The last level you successfully completed (together with accumulated score) will be stored on your device. Match 3 identical tiles by swapping a pair of adjacent tiles. To swap, drag the one tile to its neighbour or, if you prefer, click a tile and then click the adjacent one. On a tablet, touch a tile then it's neighbour or flick a tile in direction of one to swap. Tiles will only swap if three or more match either horizontally or vertically. In the example to the right, there are four pairs of tiles that could be swapped to make matches. 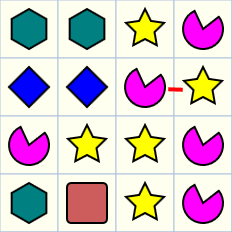 Try to match 4 tiles - example to right shows that swapping one pair will actually create two matches of 4 tiles each. After a 4 match, one tile will remain and become emphasized. When this tile is subsequently matched, it will remove all tiles surrounding it. 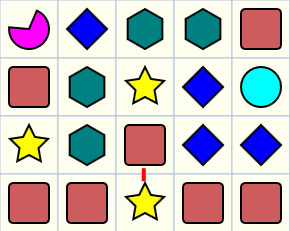 If you can match 5 tiles (see example to right), then one will remain after and become a "rainbow" tile. At any time you can choose to swap this rainbow tile with an adjacent one - this results in all tiles identical to the adjacent one being removed. So there is some strategy involved in choosing which tile to swap with. Some levels will contain hidden bombs and/or crackers. At the beginning of the level you will be shown briefly in which cells these are hidden. When a tile covering one of these explosives is removed, the explosive will be released and moved to the side of the grid. At any time, you can then drag the explosive onto a tile. Dropping a cracker will remove the tile it is dropped on and dropping a bomb will remove the tile and all its surrounding ones. Matching 3 tiles scores 50 points, 4 tiles scores 100 points and 5 tiles scores 400 points. If more than one match on a tile swap, an extra 50 points is scored. 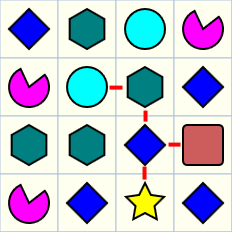 After the match(es) are removed and new tiles dropped, additional matches may be automatically formed (called a cascade). Each cascade formed on a tile swap has 50 additional points added to the total of that move. Each surrounding tile detonated scores 20 points. Each tile removed from a rainbow tile swap also scores 20 points. After successfully completing a level, any remaining seconds will add that number of points multiplied by double the level number. For example, if there are 25 seconds left after level 10 is completed, a bonus of 25 * 10 * 2 = 500 points will be scored. Requesting a hint costs 100 points.